South Korea punches far above its weight when it comes to spending on innovation. 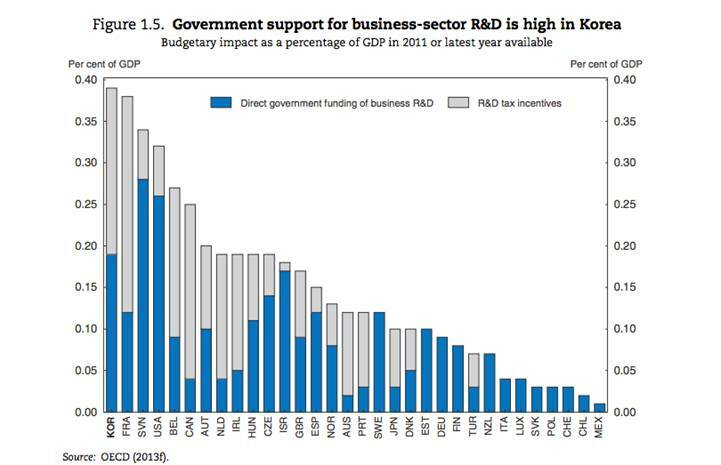 In 2012, Korea spent 4.4% of GDP on research and development. That’s the highest among the developed nations tracked by OECD, the Paris-based rich nation think tank. The private sector is a key driver. Private-sector R&D spending is up 35% between 2008 and 2011, and has more than doubled since 2003. The surge has pushed Korean patents up 32% since 2008. And South Korea’s share of global patent production was up to 5.7% in 2011, the last year of available data. (It was 2.3% of global in 2003.) There’s a fairly simple reason for Korea’s hypertrophied business R&D: Although much of this growth has been in the private sector, it’s heavily government-subsidized. Of course there are problems with this system. In particular, R&D tax credits favor large companies that pay higher rates of corporate tax. In other words, those kind of policies tend to favor corporate incumbents, and can have an unintended negative impact on new entrants trying to make their mark.